This is a very high quality unit with rugged construction using with chrome-molly hardened arms and through tubes. Powder-coated for a durable and beautiful oven-baked finish! Select your favorite color, although red is our trademark color. The basic system includes 48" hollowing bar, angle of attack adjustment feature, cross bar and uprights with attachment plate with bolt and washer. The Clark Deep Hollowing System can be used on 16" swing and larger. The new Mini Hollowing System is for 12 to 14 inch swing lathes with a shorter bar and narrower base. It comes standard with a 24" bar and the extension is an extra accessory which can be ordered from the Hollowing Parts link. The smaller systems can be upgraded with larger parts for bigger lathes to allow a turner to grow into a larger lathe without having to purchase an entirely new system. With the new Fulcrum Support Tube, hollowing from 15 to over 20" deep is greatly improved. The limit on depth is length of the hollowing bar and having enough room to mount the laser system. The Clark Steady Rest is designed to compliment the hollowing system. DON'T MISS THE PARTS AND ACCESSORIES PAGES THAT CAN ONLY BE REACHED BY hovering over the menu on the top so see the drop-down panel labelled Hollowing Parts. Watch for the fly outs while hovering or navigate by clicking on the subsections that appear at the top of the page. Clark Deep Hollowing System with laser and Fulcrum Support Tube on a 20 inch swing lathe. Lathe Size - The System can be adjusted to fit many different lathes. If you switch to a new larger lathe, then you can order longer vertical posts. The longer posts can be used with smaller lathes. The system comes standard with posts to match the largest lathe you plan to use. Unique Patented Design - An articulating system allows easy movement of the bar in and out and allows a pivoting motion. The holder can slide side to side but not up and down. Furthermore the bar is stabilized by a roller-bearing-in slot configuration that prevents rotation of the hollowing bar around its long axis. This design provides a smooth movement to preserve as much as possible the feeling of free-hand turning while allowing as much freedom of pivot and range of motion sideways for complicated movements while hollowing closed forms. Hollowing Bar - The hollowing bar is 1.25 inches in diameter and comes standard at 48 inches long with a 3/4 inch hole at one end. It is has a hardened surface for long life. A slot for the bearing is milled along the length of the bar. An adapter is included to adapt the 3/4 inch hole to 5/8 inch diameter and a second adapter is supplied to create a 1/2 inch hole. The hole is drilled 12 inches deep in the hollowing bar to allow the tool minimum overhang. Shorter bars are made to order for smaller lathes and smaller projects although the large system can be used for large and small projects. Cutters - Different tool holders tips from just about every manufacturer can be inserted in the ends, including curved tools for closed forms. I have developed straight and curved tool holders. Adjusting Base - The base slides to the side and rotates to allow the bar to be over 20 inches away from the lathe centerline for easier access to hollow closed forms. This also allows the hollowing bar to approach 90 degrees across the lathe bed. See the video of the system in action. The standard base is 24 inches long with a 12 inch long slot. An additional optional base is available to extend the length of short bed lathes. Angle of Attack Ajustment Mechanism - Unique tool tip angle of attack adjustment mechanism and smooth action ball bearing slide system included. There is a single set screw that when loosened allows the bearing to be rotated to finely adjust the angle of attack of the tool tip for different style cutters. Other systems require the turner to have to loosen the set screws holding the cutter itself. This is inconvenient and more time consuming. Since the laser holder is attached to the bar, it maintains its adjustment during this maneuver. Also shown in the video. 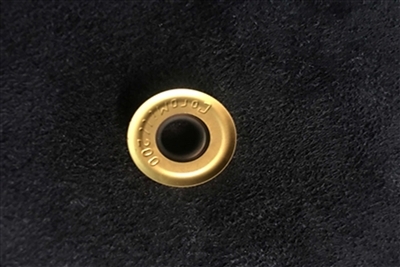 Laser Thickness Guidance Device - Laser Guidance fittings attach to the hollowing bar. This device holds a HeNe laser emitter to allow the turner to see how thick the hollow form is during hollowing. An easy push of a button on the laser activates the laser light. The laser holder articulates and tilts to get around the middle radial arm of a steady rest. This is a must when used with a steady rest. A unique fitting at the end of the laser holder arm makes re-adjustments and realignment of the laser much easier. An X-Y screw type adjustment mechanism is not needed with this system. The laser scaffold minimizes vibration of the laser light. It is also very easy to adjust by virtue of the articulated joints plus the alignment does not change during hollowing. Admittedly, when turning large diameter pieces, the steady rest itself does interfere with the laser but long vertical holders can be made to put the laser entirely above the steady rest. Hollowing a large project with steady rest. See what happened when we used an 8 arm steady rest. We only used 3 arms which will work well if evenly spaced as with the standard version Clark Steady Rest however, the 8 arm steady rest is designed for a minimum of 4 arms. We only used the bottom 2 mid positions and the 2 o'clock position which left a large area of the log unsupported. See the first video on the main hollowing system product page. New External Shaping Modification - I am excited about a new idea to use the hollowing system to rough and shape externally! All that is necessary is to add a second base ($50). The 2 bases are mounted at 90 degrees to the lathe bed and connected on the side of the lathe using the tool post in much the same manner as one would hollow. In this configuration an extremely aggressive removal of wood is possible and "catches" become a thing of the past! Now the hollowing system can double as a roughing an shaping attachment. I also now have a 1/2 inch diameter square cutter ($25) which is 4 inches long. It mounts directly into the end of the hollowing bar - no flexing and no mercy on any type of wood either hollowing or externally shaping! Roughing a log with knots etc takes no effort. I tested the system externally and was able to put my little finger inside the hole in the end of the bar and with only that finger touching the bar was able to hog off material! It is quite impressive and satisfying to see how well it works. Watch the videos on using the system. Update and Tips - From September 2012 through January 2013, hollowing systems were not shipped in an effort to test some improvements. Some modifications are minor, while others are major. I am very thankful for feedback received from many wood-turners over the past 10 years or so which has helped me refine the Clark Deep Hollowing System. Overall, the original design has proven to be excellent! However, the original (2001-2006) cam-follower bearing design and slot in the hollowing bar suffered from binding. The second generation (2006-present) adjustable ball-bearing and better machined slot provide smoother operation without binding - a very significant upgrade in performance. The Fulcrum Support Tube and a new way of connecting the Swivel Pivot Apparatus have proven to be significant advances! Recently, I have been blessed to work with Jon Leggett. Jon turns full-time in Virginia and has become an expert with the Clark Deep Hollowing System. He has challenged me to extend the system's performance envelope. Together we are defining hollowing depth capabilities and providing specific recommendations for cutting tools, accessories and techniques for various depth ranges. There are other hollowing systems on the market that cannot hollow well beyond the 8 inch depth range. I know this because I get calls from turners who are not satisfied with other systems they have purchased. The standard Clark Deep Hollowing System can easily hollow to 15-18 inches and to about 22 inches with a very careful and slow technique. Some of the variables influencing results include; type of wood, type of cutter, angle of approach of the cutter, position of the cutter relative to center-line and features of the hollowing bar itself. Of course, a major factor affecting depth capability of all hollowing systems is flexing of the bar. During deep hollowing, the tool tip is suspended a long distance from the tool rest. Tremendous forces are generated which can lead to unsavory vibrations. Vibration can be minimized by larger diameter bars, less aggressive cutting tips or very slow removal of wood. Larger bars are cumbersome and slow removal of wood is no fun! With new accessories the Clark Deep Hollowing System is potentially capable of aggressive, relatively rapid hollowing up to and possibly beyond the 30 inch depth range with the new Fulcrum Support Tube. STEADY REST- please turn safely! The Clark Steady Rests are an integral accessory for hollowing. Forces exerted by the hollowing system are tremendous. The wood can be much more easily torn from a faceplate or chuck without a steady rest. Any wood-turning task can potentially be dangerous! Proper protection, instruction and experience are necessary. CUTTER TYPE - Almost any hollowing tool will work with the Clark Deep Hollowing System up to 15 inches or so deep. Beyond that depth can get tricky and will be easier with less aggressive cutters. New turners will certainly appreciate the smaller cutters and especially guarded cutters. Hollowing can be difficult, and there is definitely a learning curve. Consistent practice and experimentation with variables being discussed will certainly be fruitful. 15 INCH DEPTH HOLLOWING - 19 mm round, carbide cutter There are really no changes from the basic system required to hollow to the 15 inch depth. Any cutter will work well to the limits of the wood and the cutter itself. Between 15 to 23 inches deep is better controlled with a less aggressive cutter and delicate technique. The 19mm round carbide cutter I sell is shown on videos at www.theokspindoctor.com. Some have suggested that this cutter will not work well because it is too large. Our experience has been excellent - it removes wood quickly and has great longevity. Yes, it can be aggressive if too much force is used. Jon Leggett has used the same cutter to hollow 22 large vessels (many were hardwood) to the 20+ inch depth. He did not even have to rotate the cutter to an unused edge. However, rpm has to be slower than expected, and the cutter is very sensitive to angle and position relative to center-line. When Jon and I were demonstrating at the Virginia Wood-turning You Turn 2 Symposium in September, we were hollowing an 8 inch diameter hardwood log at about 18 inches deep with the 19mm cutter. I turned on the lathe and set 800 rpm. Jon began hollowing and experienced bad vibrations to the point that he could not hollow. We incorrectly thought the vessel has warped overnight or that the log had moved in the chuck. I was very surprised that problems were solved with an adjustment down to 280 rpm! The cutter must be set at center-line. During removal of wood at the bottom, the angle of the cutter should be slightly down about 10 degrees from horizontal. Side removal works better with a wider angle from horizontal. The most difficult area to hollow is at the junction of the side and bottom when very deep. Removing the nub right at the center is easy if the tip is at centerline and angle is closer to horizontal. 30 INCH DEPTH HOLLOWING - the Fulcrum Support Tube Accessory- See videos that follow for very deep hollowing. Here is the really tricky issue; using a 1.25 inch diameter bar to hollow extremely deep with the Clark Deep Hollowing System. Turners typically use very large diameter bars to get to this depth and beyond, but the bars are heavy and can be difficult to control. Jon Leggett has used this system to hollow to 30 inches with the standard bar and an 8 inch Fulcrum Support Tube Accessory. This accessory mounts on the tool rest provided with my system and greatly stabilizes the bar. 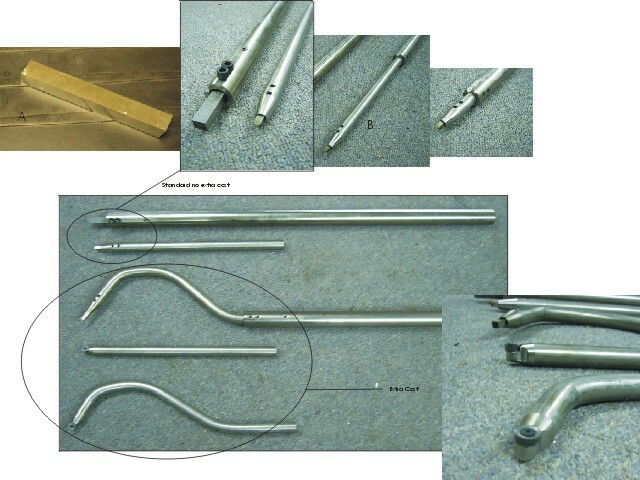 Extreme depth hollowing produces vibrations in the bar due to flexing of all the components from the base to the cross bar and the hollowing bar itself. With a secondary banjo under the Fulcrum Support Tube there is even more stability. Any turner desiring to frequently hollow beyond 15 inches consider a 12 inch Fulcrum Support Tube. Those looking to hollow beyond 15 inches may like a longer Fulcrum Support Tube. Some lathes with a tall banjo, such as Oneway lathes, will need a shorter secondary banjo to use the Fulcrum Support Tube. 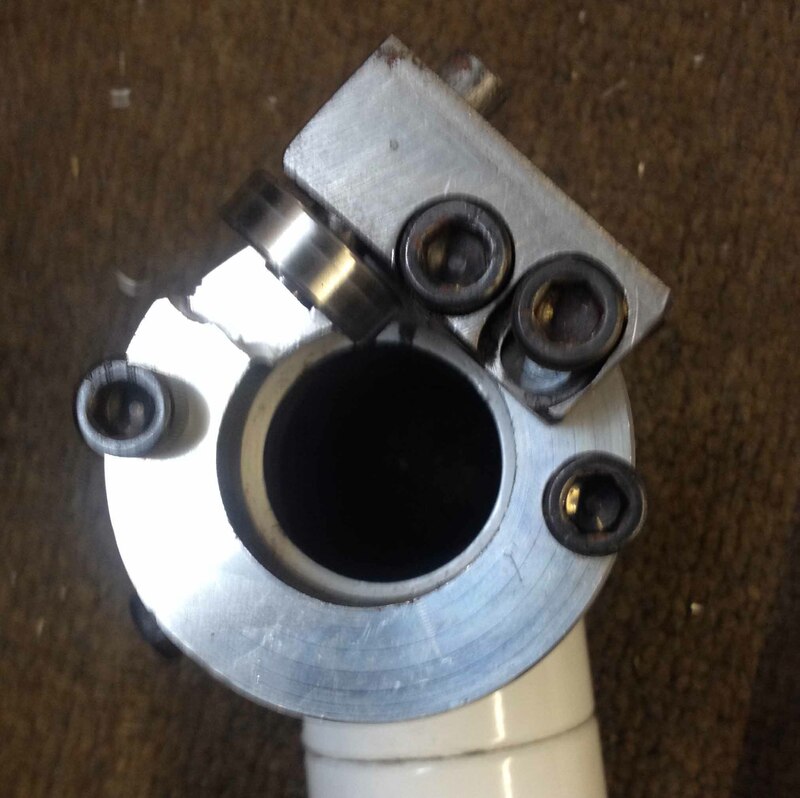 GREASE FITTING - John Leggett suggested installing a grease fitting to the swivel-pillar mechanism. It was a wonderful suggestion! The screw holding the pillars together must be tight. If play develops then there will be a source of vibration which will limit depth of hollowing. With the joint lubricated with grease, the screw can be much tighter. The pillars turn much easier and there is no binding. OPTIONAL CUTTERS - Any curve can be created but the ones shown are for closed forms since one can reach under the upper shoulder to hollow. The blowup in the lower right corner shows the round cutter. These can be ordered straight or curved holders. They can be ordered almost any diameter but usually 1/2” or ¾”. These are made in Switzerland of high tech carbide and never need sharpening. I believe they actually cut rather than scrape the wood away. The Clark Deep Hollowing System (US patent 7,191,689 B2) and companion Clark Steady Rest can be used on the smallest projects up to the largest that will fit on your lathe. It is useful for more than just deep hollowing. It can be set up to do external turning with an extra base. See the video to see how it is done. There are no words that can express my satisfaction. I am still using my old boring bar system which I purchased at aaw 2002 providence RI symposium. We added a few customized bars, a fulcrum and a cross support. The customized bars connect to my old D bar. I can now hollow up to 24 inches without vibration. I only have two feet behind my Oneway lathe bed. This solution was collaborated with Keith’s ingenuity and manufacturing ability. The Spin Doctor has spun my old boring bar straw into gold! In over twenty years of turning hollow forms I have been able to try every system that is out there, and a bunch of homemade rig's of every setup possible. I found Keith's setup online and after a bit of reading and thinking about his setup I knew I found the golden ticket. Seriously, this is the best thing for hollowing on the market. From small diameter to the largest and longest piece your lathe can hold, this thing works. And beautifully. If there is a better setup out there I would have to see it to believe it. And even then, my unit is not for sale. Awsome, doesn't fully explain Keith's setup!! Thanks, Gregg. After looking at and testing most of the deep hollowing systems on the market, I went with the Clark model. Its many advantages over all of the others will allow you to easily turn pieces you've only dreamed of. In just my third week of using the system I turned a 20 inch end grain, walnut vase that is stunning. 1. Ease of set up and a relatively short learning curve. 2. Incredibly well engineered and built like a tank, including the largest boring bar you can find commercially. 3. Price. I would have gladly paid $900 or more for this system. 4. Communication. Pre and post sale, Keith Clark will always answer your questions and help you get the most out of the tool. The Clark Deep Hollowing System has taken my woodturning to levels I never thought possible. I couldn't recommend it any more highly. The Clark system works very well. Today I finally set mine up and hollowed a small vase about 13 inches deep. Because of the laser and the super high quality steady rest this is the thinnest vase I have ever made. It is less than 1/4" thick from top to bottom. Set the cutter at the correct angle or it will bounce rather than cut. Love it. This is very well made product. It going to last me a lifetime.